just put them in the Patches folder and edit your Version.dat on the main folder with notepad like this one in the picture. Edited by Fellus, 12 March 2013 - 07:52 PM. Are there any other methods of downloading this game? I am having trouble using your downloading because when my internet got disconnected, I had to repeat the download from 0% again. It's really annoying. Are there any other download source like a direct download .zip file or torrent? I would like to play the game but I can't due to this problem. You can play the game through a browser. You still download the game, but it only downloads what is necessary to play that particular area. This means you will have a long initial load as it gets all the character data. Then somewhat long loads when going to a map for the first time. When the game updates you may also have a long load again. The game saves to a separate area with the browser version so it should not conflict with the client version. However, from what I hear the browser version is having some issues. Unfortunately, the only method to download the client version is through playrequiem.com I would definitely try the installer first. Its the most guaranteed way to get a clean install. Using manual patch files runs some risks. Edited by Rosashito69, 10 April 2013 - 07:35 AM. I can not play the game either. I downloaded from the official site initially but when it patches I get "File Not Found". I tried all of Sakana's links and they are all not working. I don't wanna play in the browser, so how can I get the client to work? Where can i find last patch file? (i think 619). I already donwload the last version from the official website. So when i tried to install the game..
Ok.. i click on retry so much time.. so still dont work..
then ill un-zip the recompress files they are 5 + the Setup file in total 6.
so it show all this archives. i Run UPDATERUSA.exe.. it show a launcher.. i say .. "finally im gonna play it"
and still cant play it. Anybody got a 0000628 RTP patch ? I need it because I keep getting the old file not found error. The links are broken, can someone please post new links to get the newest patches? I really need them, installing Requiem MM has been a hell for me :c I've tried every solution I found. i have trouble patching also pls help! im new here and i wanna play requiem baldy! error pop ups help pls! I am new here, I was hoping to try out Requiem game, I wanted to play it since it got released but didn't have the chance earlyer because of my previous LAN's port blocking, but now I remembered this game and wanted to play it, so I downloaded the latest install (I think, because I downloaded it from the official site =]), then the update process started, it took so long I had to leave my PC on for the night, then when I got up it was still going so I left it when I set off for work, and when I got back i saw an error that my download had failed. I restarted my PC and launched the updater again and my update got stuck on 00000611.RTP again with the same error. So I found this manual patch post in this official game forum and found that there are no links to ftp where the patches are held publicly and the link provided earlier didn't work anymore, so I think you will believe me when I say that I was SOOooo... dissapointed, but I didn't gave up, I googled for half a day tried lots of things, sites links and came accross this magical site that holds all of the patches from 00000016.RTP to the latest (currently 00000652.RTP ) and hopefully it will stay online and always up to date with latest patches. P.S. I hope I will not run into more problems and will be able to play the game eventually..
where do i put this patches>?? can you help me>? hi guys im new to RO2. just downloaded the client from their website. im patching right now im just at 00000063.RTP any idea how long it will take until i can play? 63.rtp is more than 1.5gig. is this the biggest patch file? bcoz ive been patching for half a day right now and still its on 35%. thanks for your help guys. 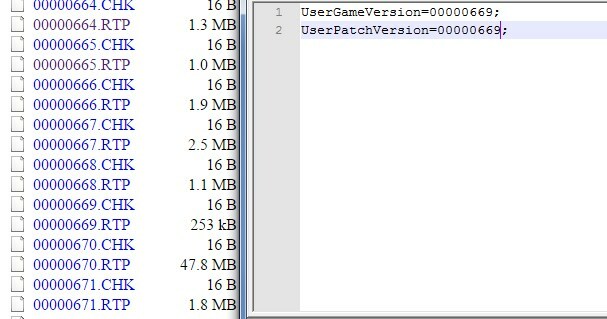 Some peoples having a trouble while downloading the patch by the default launcher, maybe the problem is because the launcher doesn't using pararel connection, patch file size, user connection speed, etc. So, This is how i do when launcher can't download the patch properly. Open version.dat inside Requiem folder using notepad/notepad++. Download the 00000670.RTP and 00000670.CHK from the link above because it's the nearest patch from ours (PS: download them 1 by 1), then put them into "Patches" folder inside your Requiem folder. Open UPDATERUSA.exe and wait until the patch done. Edited by BladeBender, 18 December 2014 - 06:00 PM. Hi, I'm here to ask about a problem that I have in Requiem Rise of Reaver, what happens is that when starting the launcher either from steam or from the normal launcher, it is updated well but when you reach the final window to start the game this mark error and only says Launcher to stop working, please help D: !! Edited by 8645150327081827000, 25 November 2017 - 05:04 PM.